Let me start this by stating that Dune is not only one of the best science fiction novels ever written, it’s one of the best novels (period) ever written. It’s my favorite single novel and it’s a masterpiece of literature, not just the genre, and I fully believe that everyone should read it. This Primer is an attempt to show you why (though you’d be better off just picking it up). The events of Dune take place in the far future, long after an AI uprising known as the Butlerian Jihad. As a result, humanity has a rule, “Thou shalt not make a machine in the likeness of a human mind.” Since the uprising, man has developed and improved the human mind in amazing ways, typically codified in special orders. The Bene Gesserit Sisterhood is one example of this, an order of women focusing on physical and mental training. They are also sometimes referred to as “witches.” Mentats are another example, humans trained in pure logical thinking, essentially human computers. Dune is not only one of the best science fiction novels ever written...it’s one of the best novels (period) ever written. Civilization is organized in a kind of feudal system headed by the Padishah Emperor, with the ruling class being a group of noble houses that make up a body called the Landsraad. The other major entity is the Spacing Guild, a group that holds a monopoly on all interstellar travel and banking. The novel focuses on the members of House Atreides: Duke Leto Atreides, leader of the house; his son, Paul Atreides, fifteen at the beginning of the novel; and the Lady Jessica, Duke Leto’s concubine, Bene Gesserit Sister, and Paul’s mother. As the novel begins, House Atreides has just been given stewardship of the planet Arrakis, also known as Dune, the source of the valuable spice melange, a geriatric agent which extends the life of those who take it. House Atreides is essentially at war with House Harkonnen, who previously held control of the desert planet. Early on, the Lady Jessica is visited by the Reverend Mother of the Bene Gesserit Sisterhood. The Reverend Mother is very interested in Paul. It seems that one of the roles of the Bene Gesserit is to manipulate bloodlines for some unclear purpose. Jessica had been ordered to bear Duke Leto a girl but she disobeyed and bore a son instead, a son she has been training in the Bene Gesserit ways. There are mutterings of a prophecy, and Paul has long felt something he calls his “terrible purpose.” He is tested by the Reverend Mother in a way that challenges all of his training. The Atreides family and their household staff move to Arrakis in an action that is but one move in a much larger scheme of political intrigue and power shifting. There they learn about the planet and its native population called the Fremen. Arrakis is clearly a hostile, dangerous world, though the dangers there go beyond the planet’s ecosystem. I won’t say any more, but the plot unfolds in a way that manages to deliver on the momentum built from the very first scene while still maintaining surprises for the reader. While Dune takes place in the far future, it’s clearly recognizable as OUR future. Elements of this interplanetary culture are taken from our current world. Cultural touchstones include names and origins taken from the French, words that have Arab or Islamic origins, and peoples who are clearly descended from the peoples of our Earth. While there are organizations and technologies that are new and futuristic (this is science fiction, after all), Herbert provides us with a world that is still inherently familiar, one which gives us solid ground to stand on. All the better for us to absorb the exciting elements of worldbuilding that he works into the story (most of which feel effortless). Despite all of the cool organizations and new creatures and prophecies and powers, the focus in Dune remains on the people, on human beings and their place in the world. It also looks closely at what choice means, even in a world that’s replete with prophecy and carefully guided fates. One of the most impressive things about Dune is that Frank Herbert is in complete control here. Dune is written in third person omniscient with the POV jumping from character to character, often several within each section. And it’s seamless. There’s no confusion, it flows brilliantly (like the spice! Oops. Spoilers). Which leads into the theme of the novel: inevitability. The surety that certain events will lead to others and there’s no escaping them. Even when a choice is offered, that choice can never escape the weight of its outcomes. It’s an interesting balance between the actions of an individual and the inexorable gravity of the actions of centuries. Herbert packs so much into this one novel. He touches on culture, on class issues, on political intrigue. He simultaneously shows the noble aspects of House Atreides while showing the inherent inequalities of the system they are part of. He explores the nature of history, and of myth. And he delves into the ideas of icons and heroes. Or even messiahs. Herbert said, “The bottom line of the Dune trilogy is: beware of heroes. Much better [to] rely on your own judgment, and your own mistakes." ...one of the threads in the story is to trace a possible way a messiah is created in our society, and I hope I was successful in making it believable. Here we have the entire process, or at least the large and some of the subtle elements of the construction of this, both from the individual standpoint, and from the way society demands this of you. It’s the references in there, you know, that the man must recognize the myth he is living in, because the creation of an avatar is a mythmaking process. Dune is also a triumph of ecological science. The novel was inspired by a trip that Herbert took to Florence, Oregon, part of the Oregon Dunes. At the time, the U.S. Department of Agriculture was attempting to stabilize the dunes by using so-called poverty grasses. Herbert began writing an article, though it was never published as such (it later appeared in the book, The Road to Dune). Herbert’s interest in ecology is evident in the book. The novel takes place predominantly on a desert world where water is a scarce resource and you feel the importance of that substance (which many of us take for granted) throughout the novel. But even more than that, it’s about how humans can live in relationship to their environment. The native culture of Arrakis develops around the ecological system of the planet, attempting to become part of its natural order. But you also have the Imperium and the Houses, who come in to try to collect the planet’s bounty, the spice, without a true understanding of how the planet operates. Oh, and did I mention giant worms? 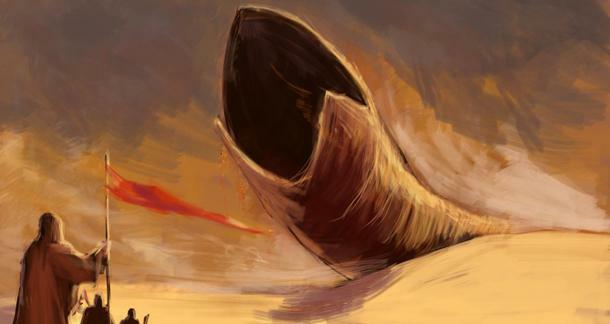 Because Arrakis, the planet in question, is home to a species of giant sand worms who are hundreds of meters in length, some specimens being over 400 meters or roughly a quarter of a mile long. The sand worms are part of the ecology of the planet, with a very special significance, though one that is best discovered by reading the novel (which really, you should). Dune has been adapted twice for the screen. The first was a 1984 movie directed by David Lynch and starring Kyle MacLachlan as Paul Atreides. Lynch disliked the final cut of the film enough to have himself removed from the credits. In 2000, the Syfy channel (then SciFi) adapted the novel into a miniseries. Both adaptations are flawed. The miniseries hews closer to the letter of Herbert’s novel but loses something in the process. I found that scenes that should have been inspiring and moving fell flat. The Lynch movie takes many liberties with the text, outright replacing some elements of the novel, but it seems to capture, for me at least, more of the heart and soul of what makes the novel so great. While I enjoyed both adaptations for what they are (and both pale next to the novel), I found myself wishing that I could somehow combine both together, taking elements from each to create a truly great movie. Your mileage may vary. Years after Frank Herbert’s death, his son, Brian Herbert, began writing a prequel trilogy with science fiction writer Kevin J. Anderson. I have never read them. They focus on the houses involved in Dune and take place just before the events of the first novel. The series was popular enough to spawn another prequel trilogy, this time focusing on the Butlerian Jihad which takes place 10,000 years prior to the events of Dune by Frank Herbert’s reckoning. Further novels followed with some taking place in the period after Frank Herbert’s series, some occurring between the novels of the first series, and others going back to chronicle the establishment of organizations such as the Bene Gesserit Sisterhood. I have not read any of these novels so I can’t speak to them, only to say that in my opinion these novels are unnecessary. For the completist, however, they offer plenty of opportunities to revisit the world of Dune. I’ve said it before, and I’ll say it one last time, Dune is one of the best novels in the English language. That it’s a science fiction novel should not be overlooked, but should also not qualify its content. Dune is a masterpiece, and I heartily recommend it for anyone interested in good fiction. As always, I welcome your opinions in the comments, particularly if they are dissenting opinions. The AI uprising isn't the Butlerian Jihad, the BJ is what humanity has to do to get rid of the AI. Hi Rajan. Your review brought Dune back into focus for me, thank you. It's been probably 30 years since reading it. Question: what are your thoughts about The Litany of Fear (Litany Against Fear? don't remember exactly what it was called) as an underpinning to the novel? Dune is also one of my favorite novels, period. The political, religious and environmental scope of the thing was never matched in any of the sequels. So good. I don't know that I'd call Dune one of the best novels ever written. Not even close, and the sequels, as you say, are pretty bad ( the ones H himself wrote--haven't read any of the others). That said, Dune is just amazing. It's a beautiful exercise in world building. I love this book. @James McArthur - thank you for the correction. @lisakay - it's funny because the Litany Against Fear is one of those things that stuck with me long after the novel and other than a few other smaller lines, it's the one part of the book I can continue to quote. I wanted to include it in the post, but it didn't seem necessary for a primer. I think that coming where it does in the book, it's definitely meant as another facet of the human vs. animal struggle that Paul's test is meant to illuminate. Animals react to things such as fear whereas humans, true humans, should be above that. It's also part of humankind's strive to replace thinking machines by elevating their own brains. But I think this is contrasted in the rest of the novel in some ways. Those who have "improved" their minds, the Mentats and the Bene Gesserit, are somehow bloodless and seem to have lost something essential to humanity in the process. As to the humans vs. animal thing, Herbert seems later in the novel to have such reverence and respect for ecology and the planetary lifecycle, for the elegant simplicity of it all, that I think it undercuts the idea that animals are somehow lesser and limited. I also think that later in the book, as Paul's powers (for lack of a better word) grow, there are so many waves crashing over him, possible futures, inevitable outcomes, that the fear becomes difficult to avoid for him. I'll end this long comment by saying that one of the things I like about the Litany is that is has a kind of Eastern flavor to it. It doesn't say that fear doesn't exist or that it will be stamped out or resisted, but that the person will let it pass over and through them, acknowledging it, but letting it go, which evokes the techniques of Eastern meditation. I would absolutely agree, one of the best novels ever written period! I don't know what it is about science fiction that the rest of the literary world finds so offensive. I read Anna Karina... it may be a classic novel, but's it's no Dune! I remember the anticipation and fear of waiting for the Lynch movie. I knew it was too short to do justice to the story, the characters came to life wonderfully, but it seemed the Imperial Sadukar had written the screen play. It was butchered! The mini series was much truer to the concepts however the charachters were flat and uninspired. Warning to anyone who has NEVER read Dune. (not sure who that might be) There is a lot going on in the first few chapters. There are a lot of characters and venues that are being set up, it takes a while to get going the first time. This is a book that often gets read more than once, after the first time the early chapters set up a tingle of anticipation!